Registration – Please save the date for this webinar on Wednesday, May 29th at 1 pm ET. This is a members only webinar. The registration link will be posted next month. ABSTRACT: Cortical plasticity is the neural mechanism by which the cerebrum adapts itself to its environment, while at the same time making it vulnerable to impoverished sensory or developmental experiences. Like the visual system, auditory development passes through a series of sensitive periods in which circuits and connections are established and then refined by experience. During these periods, the functional maturation of auditory processing and perception is critically dependent on adequate auditory experience. Unfortunately, in cases of sensory deprivation, such as congenital deafness, this process is arrested. Fortunately, it appears that this situation can be reversed in individuals that receive cochlear prosthetics. Current research is expanding our understanding of cerebral processing and organization in the deaf. In the congenitally deaf, higher-order areas of “deaf” auditory cortex demonstrate significant crossmodal plasticity with neurons responding to visual and somatosensory stimuli. This crucial cerebral function results in adaptive, compensatory plasticity. Not only can the remaining inputs reorganize to substitute for those lost, but this additional circuitry also confers enhanced abilities to the remaining systems. In this presentation, we will review our present understanding of the structure and function of “deaf” auditory cortex using psychophysical, electrophysiological, and connectional anatomy approaches and consider how this knowledge informs our expectations of the capabilities of cochlear implants in the developing brain. To learn how anatomical, electrophysiological, and psychophysical techniques can be used to examine the functional organization of the auditory cortex in hearing and deaf subjects. To learn how the absence of auditory input during brain development alters the developmental trajectory of auditory cortex and how even short periods of acoustic experience during development can have a major influence on cerebral organization. To appreciate how cochlear implants can re-establish an auditory cortical organization similar to that of a hearing individuals. 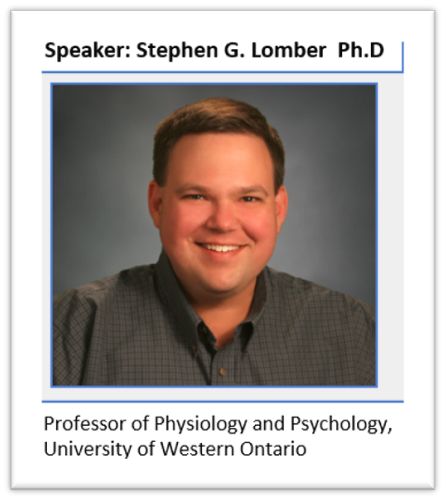 Stephen G. Lomber, Ph.D. is a Professor of Physiology and Psychology at the University of Western Ontario where he holds the Canada Research Chair in Brain Plasticity and Development. Steve directs the Cerebral Systems Laboratory (www.cerebralsystems.ca) and is a Principal Investigator in the National Centre for Audiology and the Brain and Mind Institute. Dr. Lomber’s lab uses an integrated approach of psychophysics, electrophysiological recording, neuroanatomical techniques, and functional imaging to examine processing in auditory cortex. Work in the lab examines cortical plasticity in the presence and absence of acoustic input, and following the initiation of auditory processing through the means of cochlear prosthetics. He is the Associate Editor of Hearing Research, and a past chair of the Gordon Research Conference on the Auditory System and the International Conference on Auditory Cortex.